Dr. Robin LePardo grew up in Seymour, Connecticut where she graduated from Quinnipiac University with a Bachelor of Science degree in Veterinary Technology. During her undergraduate years, she performed various animal husbandry jobs in large and small animal areas, worked as a veterinary assistant at a small animal hospital and also with a mixed animal practitioner, and finally did an externship at a pharmaceutical company in laboratory animal husbandry. Upon completion of her Veterinary Technology degree, Robin was accepted to Purdue University School of Veterinary Medicine, where she received her DVM in 2007. In the spring of 2007, she accepted her first associate veterinarian position at Ebenezer Animal Hospital and relocated to sunny Rock Hill, SC. This position lasted about 4 & ½ years and allowed her to use her personal talents and the exceptional skills she learned at Purdue, as well as developing both confidence and a true conviction to veterinary medicine. Although she knew she would miss her clients deeply, she felt it was time to experience other areas of veterinary medicine, so she left Ebenezer Animal Hospital to begin providing relief veterinary work in both North and South Carolina, which included small animal general practice and emergency medicine. 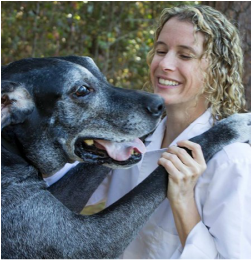 After 3 years of traveling she accepted a full time associate veterinarian position at Veterinary Medical Center of Fort Mill where she worked with an exceptional veterinary team and a doctor who was a true inspiration for her, Dr. Julie Reck. Over a period of 4 years she contemplated practice ownership and after much thought, decided it was time to start pursuing her quest of practice ownership. She wanted to return to the area of her first associate position as this area is home to her and her family. So began the dream and the hard work that would lead to the opening of Central Carolinas Animal Hospital. Robin has a strong interest in veterinary dentistry and surgery, including both soft tissue and orthopedics. While her passion lies in these areas, relief work has helped her stay current in internal medicine while also experiencing a vast array of modalities to veterinary medicine, surgery and practice management. She resides in South Carolina with her husband Charlie, her Great Dane Titan, and three cats Target, Rainman, and Michelin. Titan, Target and Rainman were all rescued animals and made the trip to Rock Hill from Indiana with them, while Michelin was acquired here in Rock Hill after being found in the road hit by car. Keeping her practice a true family operation, Robin had both Titan and Target depicted in the hospital's logo! Her hobbies and activities include yard work and gardening, riding her motorcycle, kayaking, and attending concerts. Professionally, Robin served as a District 5 representative for the South Carolina Association of Veterinarians for a term of three years.